A label is a way of categorizing a card by type, represented by a color and term or, for colorless labels, a term only. 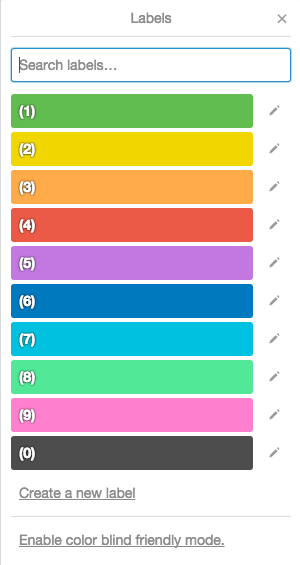 There are 10 label colors to choose from in Trello, and a colorless label option. You can choose to add label names if you wish. A single card can have multiple labels. Colored labels will display on the front and back of a card, and colorless labels (represented by the light gray color) will only display on the back of the card. Labels help to categorize cards on a board. 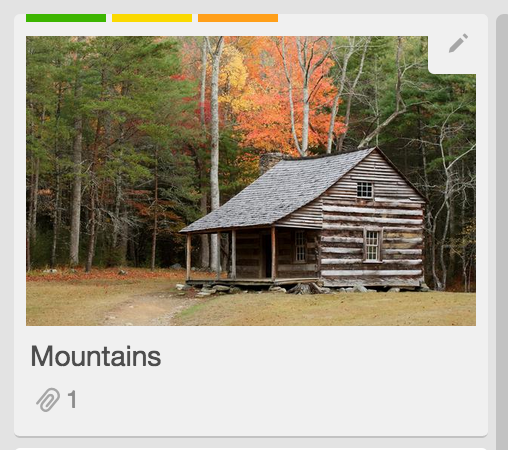 Add labels to a card via the card back's "Labels" button, from the card's edit menu (click the pencil icon on hover) or by hovering over the card and using the shortcut "l" (lower-case L) to see all available labels. If you know the number shortcut (see further down) you can also directly add the label by pressing the respective number. Active labels are represented on the front of a card and under "Labels" on the card's back. The labels are sorted by color, see shortcut table below for sequence. Click the labels menu to add labels. 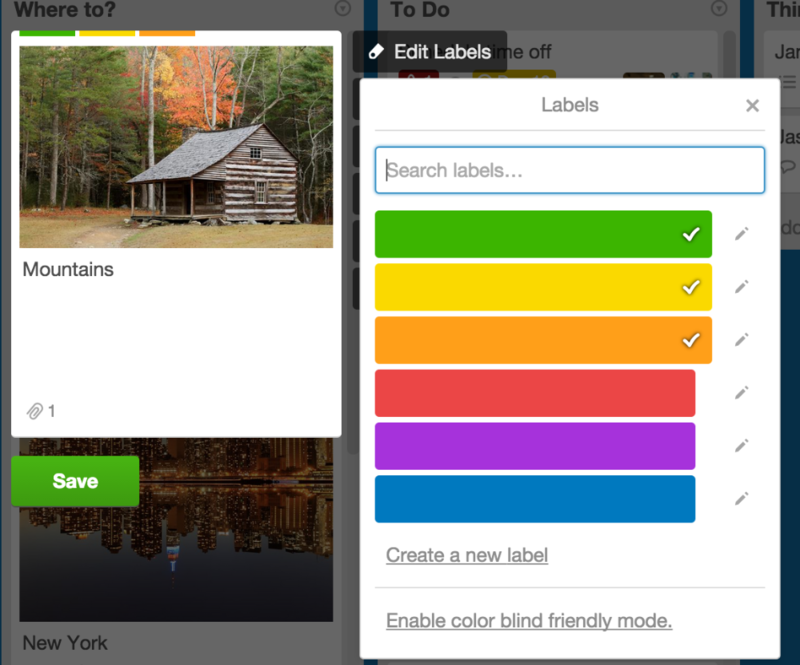 Remove a label from a card via the card back's "Label" button. 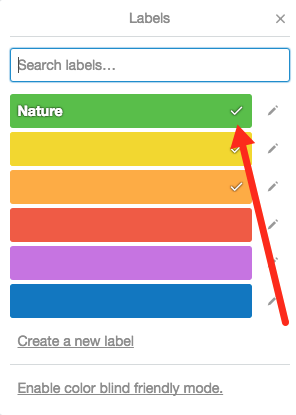 Active labels are represented with a white check mark. Click an active label to remove it. By default, only the color of the label will show when viewing the cards from the board view, not the names of the labels. If you'd like to see the names of the labels, you can click on the label to display its name. Clicking on the label again will hide the name again. If you would like to move a card from one board to another, any labels that do not already exist on the destination board will be automatically created when the card is moved. A quick way to copy labels from one board to another, is to create a temporary card and add any labels that you would like to move over to that card. Then, you can move the card to the destination board, and all of the labels will be created for you. You can also add and remove labels pressing "l" to bring up a pop-over menu of labels. Toggle an individual label by pressing numbers between 1 and 9. 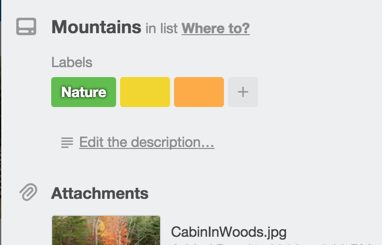 Individual label shortcuts are mapped below.